Meditate frequently on the sorrows of the Mother of God sorrows inseparable from those of her beloved Son. If you go to the crucifix, you will there find the Mother, and, on the other hand, wherever the Mother is, there, also, is the Son. Happy Feast of Saint Gemma! Today the Scala Santa in Rome will be uncovered for pilgrims to ascend directly upon the steps of marble which Our Lord was condemned to death on. I am going tomorrow morning and invite you to send your intentions for me to take with me: find out more here. When Caiphas put that loaded question directly to Christ: “Tell us, art thou the Christ?” Our Lord replied in kind. Remembering what abuse He had suffered when that question had been asked for the first meeting of the Sanhedrin a few hours earlier, our Lord said: “If I tell you, you will not believe me, and if I question you, you will not answer me, or let me go.” Here the Master was clearly referring to the prophecies of the Old Testament regarding the Messias, which they, as scholars and teachers, were supposed to know well, and which, if they would only open their eyes, could see clearly were fulfilled and verified in Him. The high priest and the Sanhedrin had but one single thought and that was not the fulfillment of the prophecies but the destruction of Christ. The merciful Christ in an endeavor to impress His enemies with the salutatory fear of the consequences of their unjust action, added as He did at His first trial – “you shall see the Son of Man sitting on the right hand of the power of God,” alluding clearly to the final judgment of all men, where true justice would prevail. Will you not go to Christ in His tabernacle today, and appease His wounded heart for all the indignities heaped upon Him before Caiphas and the Sanhedrin? Tell Him how ready you are to do His will in all things. 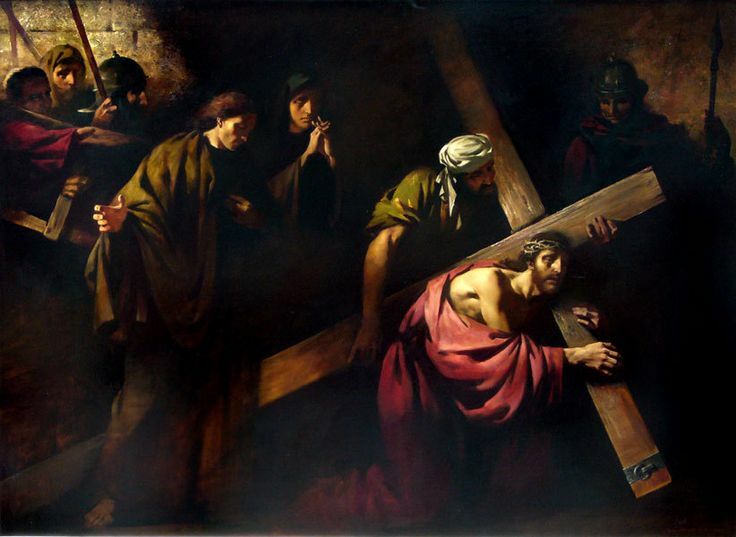 There is hardly another scene in the whole terrible story of the Passion that compares with the one in which mere mortals taunted, mimicked, maltreated, and grossly insulted the veritable Son of God. No artist has ever tried to portray this vicious scene. 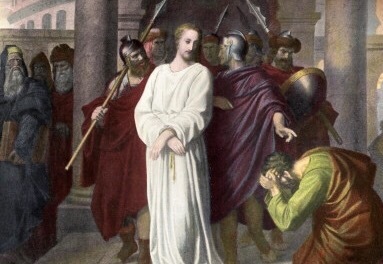 We have paintings by famous artists of the flagellation, the crowning of thorns, and the crucifixion but none has dared to depict the scene wherein Christ was so basely treated in the home of the high priest Caiphas in the early hours of the morning following His arrest. Not one artist has dared portray men spitting into the adorable face of God. It shocks even one’s imagination to conjure up such a picture. [Father Doyle must not have been aware of the works of Bl. Fra Angelico at St. Mark’s in Florence or he could have seen them as not able to convey how terrible the torturing of Christ was]. The worst criminal would have been given time to rest before his arraignment before the Roman authorities on the morrow. He would have been given bread and water, but not Christ. Small comforts were denied Him. He was bound to a small pillar by iron chains and bound in such a position as not to be able to stand erect or to fall to the hard floor. In His darkened hour in the garden of Olives an angel came to comfort Him, but here, He saw naught but the cruel soldiers mocking and reviling Him. Even His enemies were shut off from Him by the dirty cloth with which He was blindfolded. “Thou dost claim to be a Prophet,” they shouted. “Well, tell us who is striking Thee.” You say You are a king – well, You will be crowned a king tomorrow. All the time they reviled and mocked Him, the soldiers kept striking, kicking, and spitting into His face. Who is it that endures such torments? It is Jesus Christ, the Son of God, at whose birth the angels sang: “Glory to God in the highest,” the same one of whom God the Father said: “This is my beloved Son, in whom I am well pleased” (Mt. 3:17). What has happened that He is so abandoned and so insulted? Let us say here and now that no one compelled Christ to undergo this torment. He offered Himself of His own free will to pay the ransom for your sins and mine. Ask yourself if there is or has ever been anyone who has loved you enough to suffer thus for you? To whom then does your love belong? Christ bore the heavy chains to free us from the galling chains of our passions and sins. He bore a prison sentence that we might be freed from the eternal prison of hell. He endured the spitting in his face to repair for the awful insults men have offered, and do and will offer His eternal Father. 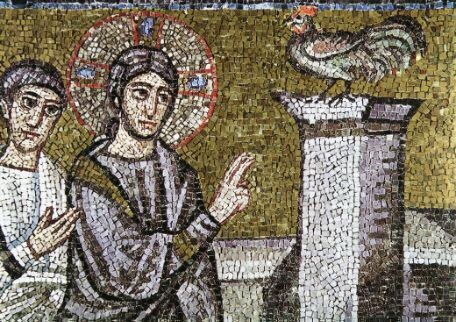 Go to your Christ in His new prison – the tabernacle – and beg pardon for the insults you have heaped on Him by your sins. If you condemn in your heart the foolish men who insulted our Lord during the Passion, think how much worse your insults are since the soldiers were pagans but you are a child of God and a follower of Christ. This week the Scala Santa in Rome (the steps from the praetorium of Pilate, upon which Jesus was condemned to death) are being uncovered. They have been covered with wood as to protect them. They will be uncovered for 60 days. Friday morning I will make a pilgrimage there. I will take your intentions with me. I invite you to write to me via my contact page: here with your intention.